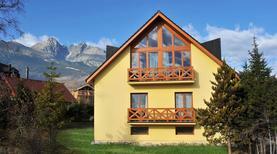 A holiday house in Slovakia costs on average USD 523 in the cheap travel period and USD 831 in the peak season per week. These details are of course in relation to the house and not per person as well as includes the obligatory additional charges. Slovakia is a small landlocked country in Central Europe. 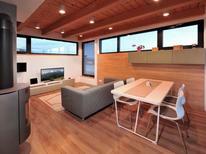 Typical holiday homes in Slovakia include gable roofed mountain cabins and elegant Danube-view flats. In addition to some of the best quality-to-price accommodations in Europe, there are plenty of reasons to visit Slovakia: its enchanted castles, medieval towns, wooden churches, cafes overlooking the Danube river, museums, and general sense of authenticity. Virtually untouched by mass tourism, and with excellent travellers’ facilities, Slovakia is one of the best destinations for a holiday home vacation in Europe. 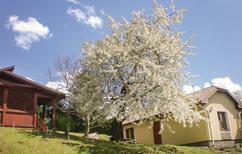 On TUI Villas you can find holiday homes located in different parts of Slovakia. If you like museums, cafe culture, 18th century buildings, and the Danube, book a flat in Bratislava, the capital city. If you are a nature person, prepare to be spoilt for choice! The country's north has some of the best mountains in Central Europe, while the south is dominated by the green Danube lowland. History lovers will enjoy exploring the enchanted castles and UNESCO wooden churches spread all around the country. Slovakia has the highest number of castles per capita in the world. Virtually every town in Slovakia has a castle, with many located amongst beautiful scenery. Bratislava features an old castle with spectacular views over the city, as well as the impressive Devín Castle, located on a cliff overlooking the Danube river. Other not-to-be-missed castles are Nitra in the west and Orava in the north. Slovakia is also home to a number of beautiful medieval towns, among which Levoča, with its virtually intact fortification walls, is a true jewel. Adventurous travellers can rent a car and discover the UNESCO-protected wooden churches spread country-wide, while modern art enthusiasts and foodies can explore the main cities of Bratislava and Košice. Slovakia is the best-kept secret among nature lovers. Roughly 20% of the country is made up of protected national parks. Scenic hiking trails along mountains and waterfalls are accurately marked and signposted. For this reason, Slovakia is often referred to as a hiking paradise. The two main hiking destinations in the country are the High Tatras—a rugged park of mountains, valleys, and lakes—and the gorge-riddled Slovensky Raj National Park. Apart from hiking, Slovakia, with its 2,400 caves, is also a top destination for spelunking. The Dobšinská ice cave is particularly impressive. TUI Villas offers a large selection of holiday homes in Slovakia’s mountainous areas and national parks, most of which are typical wooden gable roofed cabins with a garden and barbecue area. Slovakia’s cuisine is characterised by meat, cheese, and potatoes, by the use of paprika, and a love for wine. You can taste local wine along the Little Carpathian Wine Route between Bratislava and Trnava. Beer fans won’t be disappointed either: The Zlatý Bažant brand is of excellent quality. The best way to taste Slovakian food is by eating in a Salaš or Koliba, authentic unpretentious eateries. The national dish is Bryndzové halušky, potato raviolis topped with a sheep cheese called bryndza and bacon. Travellers with children will love the availability of meat schnitzels. What makes Slovakian food truly special, however, is the ingredients’ quality. 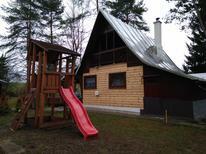 If you are staying in a holiday home in Slovakia, try cooking a typical meal using fresh local ingredients. Travellers willing to venture out of Bratislava have so much to discover. The Upper Tatra, the tallest mountain range in the Carpathians, is a hikers’ paradise featuring 600km of signposted hiking trails along peaks, forests, and lakes. Central Slovakia, on the other hand, is known for its beautiful little towns, including Banská Bystrica, a medieval mining town, and Vlkolínec, a traditional Carpathian village, and for the fairytale-like Orava Castle. East Slovakia is worth visiting for its medieval jewel, Levoča, for the gorge-riddled Slovensky Raj National Park, the burghers’ houses of Bardejov, and the cosmopolitan city of Košice. 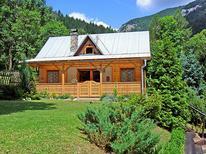 Holiday apartments in Slovakia available on TUI Villas in these areas include wooden cabins in the mountains and medieval burghers’ town houses. Travelling to Slovakia from the UK is very easy: Low-cost airlines connect most UK cities with Bratislava's Štefánik Airport, while London is also connected with Košice in East Slovakia. Bratislava's airport is only 9km away from the city centre, a distance that can be covered by direct bus or taxi. Another option is to travel to Vienna International Airport, 60km west of Bratislava, where both flag carriers and low-cost airlines operate. From Vienna International Airport you can reach Bratislava by bus, train, or a scenic boat ride along the Danube. Moving around Slovakia is extremely easy: The country has one of the best and most affordable train and bus networks in Europe. 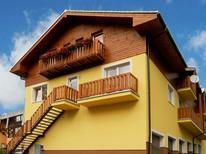 The best time for a holiday in Slovakia largely depends on the purpose of your trip. If you enjoy winter sports, you can book a holiday apartment in Slovakia’s Carpathians between December and March, when temperatures are close to zero degrees Celsius. If, on the other hand, you fancy hiking, May to September is the best time as days are warm but almost never too hot, and rain is scarce. Spring is ideal for sightseeing and strolling around Slovakia’s main cities. July is the best month to take in Slovakian folklore at one of the folk music festivals. September is great for wine harvesting festivals. Slovakia’s currency is the Euro. ATMs are common throughout the country. British citizens do not need a visa to enter Slovakia; they can enter with a passport valid for the entire length of their stay. No special vaccination is required but the Hepatitis A vaccination is recommended, while a rabies vaccination is recommended only for travellers who might come into direct contact with bats. Pets need a microchip, valid rabies vaccination, and a recent health certificate to enter Slovakia.